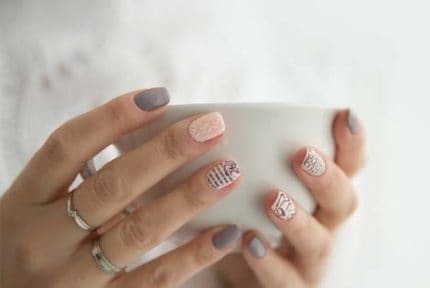 How do you keep your nails perfectly manicured, currently? Perhaps you have the time and are willing to put out the money to go to get your nails done, or maybe you’ve just picked up some cheap nail clippers at the local drugstore. If you’re looking to up your manicure game, you’re probably going to need to invest in a good pair of clippers. Choosing subpar ones can leave you with hangnails, rough edges, and potentially worse! We’ve got all of the best nail clippers waiting for you! Let’s get started! 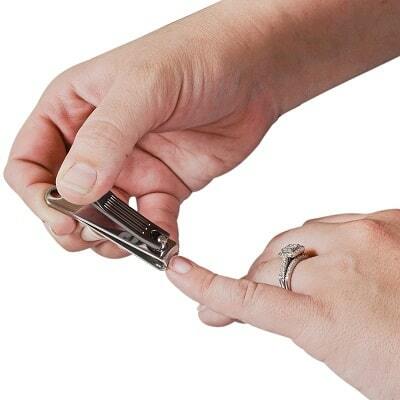 Here’s a quick overview of the best nail clippers and a few facts about them. Now that you’ve had the chance to read an overview about each of the best nail clippers, you’re probably interested in learning more. Scroll down, and you’ll find an in-depth review about each product you’ve got your eye on! If you haven’t heard of the Seki Edge SS-106 nail trimmers before, that’s okay. Most people aren’t very in-the-know with clippers. However, they are pretty much celebrities in the nail-trimming world! What’s just so amazing about them? Well, the super-sleek, Japanese made Seki Edge Stainless Steel Fingernail Clippers are among some of the top-rated on the market. However, we never just take online reviews and random consumers’ word for it; we need to experience a product for ourselves before we tell you it’s okay to purchase it. However, we were pleasantly surprised that they lived up to our expectations and more. From the creators of the Samurai sword in the mountains of Seki, Japan, they’ve taken century-old craftsmanship and combined it with modern technology to give you an amazing grooming product. Crafted with a twice-tempered stainless steel edge along with cast-iron, it’s some of the strongest clippers on the market you’ll find. If you’re looking for some that will last you throughout the toughest nails and years of consistent use. The super-strong lever provides a precise and clean cut, without you having to exert a lot of force like you may have had to with your last clippers. Not only is the model functional, it’s also stylish. 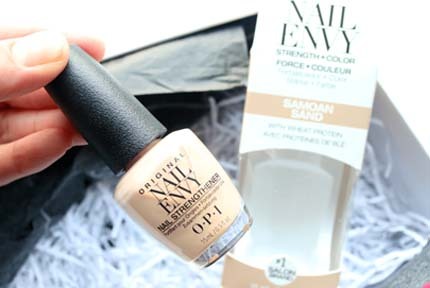 The ergonomic design features a sturdy grip that assists in giving a smooth, simple experience to shape your nails quickly, and the finish is gorgeous. Everything about these clippers is designed to fit comfortably and natural in your hand, so you have to exert the least amount of energy possible to give the perfect trim! Really, the only thing was that there isn’t any kind of file or nail-cleaning tool included. When it comes to babies, you (hopefully) already know that you can’t just use regular adult clippers. Babies have much smaller and more sensitive skin and nails, so the clippers you decide on should be built with that in mind. While you’d think each baby clipper model would, unfortunately, that’s not the case. That’s why we love the Safety 1st Sleepy Baby Clipper. The clipper has curved cutting edges to cut easily and quickly while going with the natural curve of their nails to minimize resistance. If you’re worried about precision, you no longer need to stress. We know how nerve-wracking it can be since baby nails are so small. That’s why we loved the built-in LED light they’ve thoughtfully included at the tip! The battery is very long-lasting, too, so you don’t have to keep purchasing new ones. It’s also quite simple to use, with the large, ergonomic soft-touch handle. You don’t have to try to twist and maneuver your hands just to get a precise cut or to cut the nails at all. It provides more stability and is just downright more comfortable than your typical clippers. They’ve even included a baby-appropriate emery board to keep their nails nice and smooth, and a specific slot to fit the emery board into when not in use! Now, on to the “cons”. Really, there was only one for us, which was the fact that the LED light turns on by itself. This can be a hassle, especially if your child decides they want to stare at the light while you’re trimming their nails. It will turn off automatically after a couple minutes, however, so you can choose to wait it out. Just by looking at Kiya’s Black Steel Nail Clippers, you can tell they’re of the highest quality. We all know that carbon black is, well, the new black. But, while these may be luxuriously trendy, their high rating comes from the actual performance. Kiya is a brand which began creating kitchen knives over a century ago. While their knives have always been recognized for their high quality, the company has only become more advanced over the years. Their steel instruments are some of the best, and that’s exemplified here with this instrument. Sophisticated, yet unpretentious, the Kiya nail clippers are created with steel, covered in a protective plastic exterior. Even more, they each come with a sheath made with that same plastic, which functions as a super convenient place to catch nail clippings until you have to dispose of them. As with many other Japanese manufacturers, these feature precise handiwork. 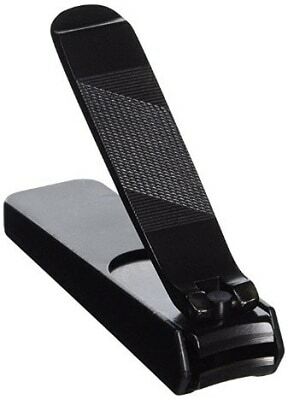 The Japanese nail clippers have super-sharp edges which make trimming seamless and make operation smooth. You don’t have to force the clippers to cut, as you would with many lower-quality products. They’ve even included a file on the rear side of the lever so you can easily round and smooth out the edges of your nails, for a completely manicured look and feel. They’re not the cheapest clippers out there. However, because they’re made of some of the strongest metals in the world, they’re going to last you much longer than the nail clippers CVS or your local drugstore carry. By now, you’re probably thinking, “Another pair of Japanese nail clippers?!”. We understand! The Japanese just really know their steel and how to handcraft them into beautifully useful tools. 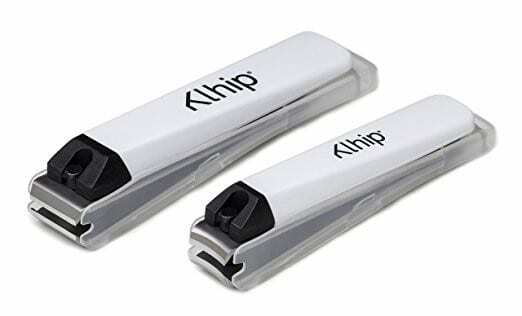 The Klhip nail clippers are no exception. Also made out of Seki, Japan, the Classic Clipper Set from Klhip is not a product you should just scroll on by. The precision stainless steel is super durable; perfect for thick or particularly tough nails and will last you for many uses. The molded plastic exterior makes them comfortable to handle and makes them fit more naturally in the hand for easier use. Don’t! With the handy clipping catcher, they’re cleverly hidden behind the jaws of the clipper, to catch the remnants as they’re removed. In addition, underneath each handle you’ll find an integrated nail file, so you never have to worry about sharp or rough edges again. So, what do you actually get with your nail clippers set? There’s a set of two: one large, straight-blade toenail clipper, along with a medium-sized, curve-blade fingernail clipper. The straight edge is obviously because our toenails not only tend to be straighter than our fingernails but also thicker/tougher so the extra resistance of a straight edge comes in handy. They made our Editor’s Pick, not only because they’re just excellent products, but because you get both clippers, and they’re very affordable! Not really. Unless you only need one clipper or the other, then this is a great selection for just about anybody! Not for those who only need exclusively toenail clippers or fingernail clippers. If you’re looking for some nail clippers on a budget, then there are endless options available to you. However, when you begin to go into the high-quality territory, it becomes much more difficult to find yourself a pair that won’t cost you more than you’re willing to spend. 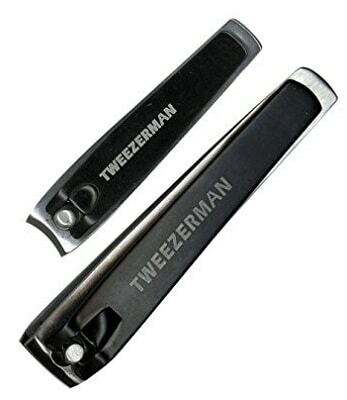 The Tweezerman Stainless Steel Fingernail Clippers. Tweezerman is a very well-known brand in the hygiene and beauty world, as they consistently produce products that are innovative, work well, and look good, to boot. With the Deluxe Nail Clipper Set, you can easily trim fingernails and toenails with precision. The strong, sharp cutting stainless steel edges make trimming a breeze, and a very minimal amount of force is needed. They’re also very durable, due to the steel, but also very easy to clean. The fingernail cutters feature strong, sharp, and curved blades. The curvature is to follow the natural curve of the fingernails. The toenail trimmers feature straight-edge blades, providing impressive precision while ensuring nails do not tear or split. The handles. They aren’t the most comfortable to use, as there is no type of “soft grip” or plastic exterior like so many others have. Perhaps use these for shorter sessions, if you can help it! Now that you’ve read through each of the in-depth product descriptions/reviews above, you may still have some lingering questions about which clippers to purchase. That’s okay! To make sure you’re completely confident in your selection, we’ve gone ahead and created a buying guide to lead you on the path towards success in finding the best nail clippers for you! Most nail clippers out there, and possibly even the ones you currently have in your bathroom, generally feature a nickel-plated body. While they may look just fine, the short amount of time they last are honestly not even worth purchasing. Nickel-plated clippers are very vulnerable. After being dropped a couple times, you’ll start to see the outer coating crack, leaving the inner body exposed. Once that inner body is exposed to any kind of moisture, you’re going to start to see rust. Since it’s so easy to clip our skin with clippers, rust is a serious issue! 100% stainless steel, if you can swing it! That way you don’t have to worry about it rusting or anything else, while also lasting you a much longer time! Unless you’re some kind of nail clipper expert, you may not know that there are a lot of variables when it comes to the cutting edges of clippers. The lower-quality ones are going to be duller and less precise. Make sure that the bottom and top blades line up perfectly so your nail is perfectly cut, with no splitting or tearing. 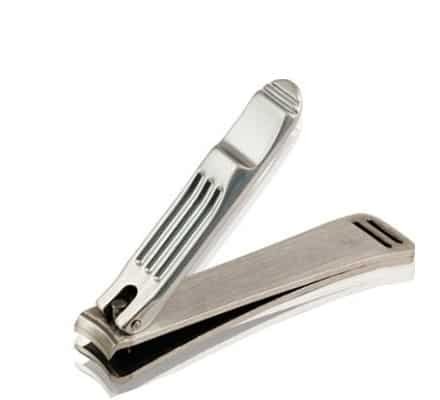 A huge percentage of the population uses the same clippers for fingernails and toenails. You could, but you’re probably not going to get as good of results as you would using the proper tools. The biggest difference between the two types of clippers has to do with the size and thickness/hardness of your fingernails in comparison with your toenails. You probably already know toenails are much thicker and larger, which means you need a bigger, more heavy-duty tool to cut them. You’ll also need a larger handle to give you the leverage needed to cut the thicker nails. That being said, you could obviously use toenail clippers on your fingernails, however, you do risk injury due to the larger head along with more cutting power. Fingernail clippers will also feature a curved edge to let you easier navigate around the edges and give a close cut with ease. Also, think about the possibility of bacteria being transferred to and from your toenails to fingernails. This is never a good idea, and it’s better to play it safe by using the instruments intended for these purposes. This should go without saying, but make sure you’re purchasing the correct type of clippers for the person who will be using them. If you’re buying them for your baby, you must purchase specially-made baby clippers. 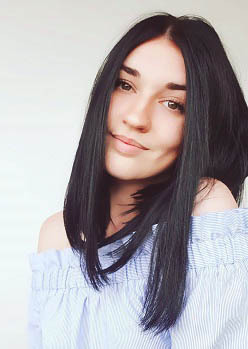 In addition, if you’re buying for a man, you may find that you need more heavy-duty clippers than women would, as many times their nails are thicker and harder. Obviously, you’re going to want to take price into consideration when looking for the best nail clippers for you. Think about how much you want to spend beforehand, and don’t waiver from that number. Price doesn’t always equal quality, so you can definitely find some at a reasonable price that are still very high-quality. They may not have every single feature possible, but think about which are important to you and which you can do without. So, which one of these are your favorites? If you’re still having trouble deciding, our pick is always a good choice: the Khlip Stainless Steel Clippers. Not only are they made with some of the most durable materials, they will give you a precision cut with minimal effort required on your part. 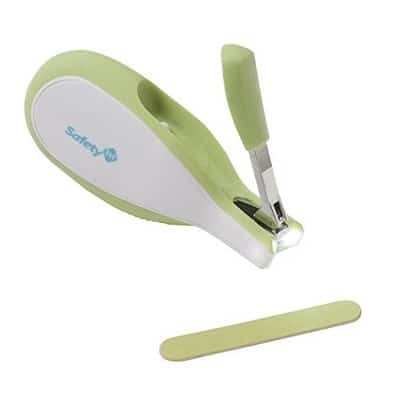 They include both fingernail and toenail clippers, that have a molded plastic exterior which fits comfortably in the hand, as well as clipping catchers and nail files. Oh, and they’re listed at a very affordable price! So, which of these best nail clippers will be making their way into your manicure arsenal?